The Cadillac photo featuring Smash 137's mural in Detroit. Swiss artist Adrian Falkner, who signs his work as Smash 137, has filed a lawsuit against General Motors for featuring his commissioned graffiti artwork in a Cadillac campaign ad, claiming the automaker’s photos featured on social media infringed on the copyrights of his work. Falkner is arguing that Cadillac infringed on his signed mural’s copyright “for misappropriation of his original graphic expression,” and that the automaker “deliberately removed” his signature from the mural in their advertisements on social media, with an estimated potential reach of over six million followers. 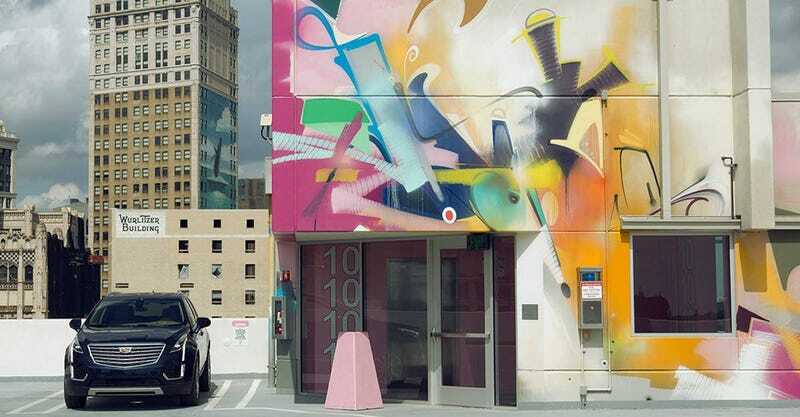 The lawsuit also refers to the Detroit parking structure in question as an “art gallery,” and indicates the mural was commissioned by the building owner as part of a marketing project involving multiple artists. Graffiti copyright protections have gotten much stronger in recent years, with artists’ murals finally recognized more as genuine works of art. One landmark case involved 21 graffiti artists who were awarded $6.7 million last year, whose works were destroyed when a complex in Queens was demolished for luxury apartments, after the complex owner had granted the artists permission to print on the building. A hearing to consider the arguments of Falkner’s case against General Motors is schedule for Monday in Los Angeles, which is where the freelance photographer who took the photos is based.